Do you want your garden deck to stand out from the crowd? We at TimberTech offer several extra features that will really help to give your deck that little extra something. 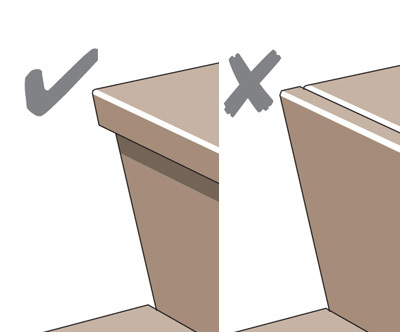 From composite wood steps to seamless edging and our attractive ‘picture framing’ option, we have a variety of great options for you to choose from. If you want to create a transition between two parts of your deck, or between your deck and the rest of your garden, TimberTech’s composite decking steps are a very stylish way to do it. The steps will be made to match the deck itself, and our experienced installation team will ensure that everything looks perfect, right down to the smallest detail. Our decking steps blend seamlessly into the rest of the deck design, and we can even include lights for added illumination and safety. Our boards can also be used as decking edging so as to give your new deck a smooth, flawless finish. This is particularly effective for elevated decks, where the edging can be used to make the deck’s border look more appealing. Speaking of borders, we also offer a unique ‘picture framing’ option. 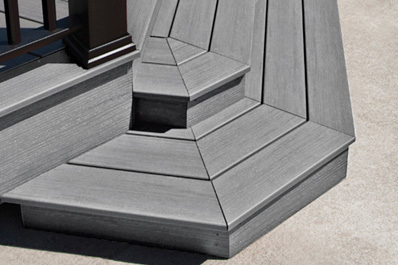 This involves the use of a second colour to create an eye-catching surround for your decked area; if, for example, you have chosen to use our VertiGrain Grey decking for the main body of your deck, we may suggest using EasyClean Tropical Storm Grey to create a contrasting border. When you order your decking materials from TimberTech, you will be able to choose from two different deck fixing options: CONCEALoc® and TOPloc™. CONCEALoc ® is a hidden fastener system, available with all of our grooved profile deck boards; using CONCEALoc ® fasteners will ensure that your deck fixings are not visible once the deck is complete. TOPloc™ deck screws (available across all TimberTech ranges) are colour-matched to your deck boards to minimise visibility. Regardless of which option you choose, you can rest assured that the appearance of your TimberTech deck will not be sullied by unsightly deck fixings. If you would like to learn more about any of the options discussed on this page, contact the TimberTech UK team today!